The Requirements were ISSUEED effective in 2012. 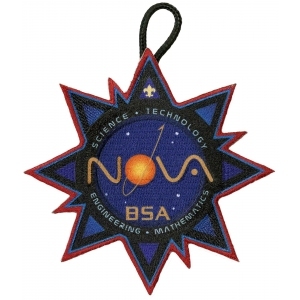 Second-Level Supernova Award for Scouts BSA. Complete TWO additional Supernova activity topics, one each in the two STEM areas NOT completed for the Harris Supernova Award. Participate in a local, state, or national science fair or mathematics competition OR any other equally challenging STEM-oriented competition or workshop approved by your mentor. An example of this would be an X-Prize type competition. Be sure to receive approval from the appropriate unit leader. Research a scientific, technical, engineering, or mathematical breakthrough or invention of the past 100 years that has affected our society in a meaningful way and present your hypothesis on how it might further affect our society during your lifetime. Present either a 30-minute oral report or a 1,500-word written report to your mentor.